A man slaps his girlfriend with black berries in Vero Beach following the Mayweather vs. McGregor fight. VERO BEACH – Following the Mayweather vs. McGregor fight, a man slapped his wife with black berries to the forehead in Vero Beach. 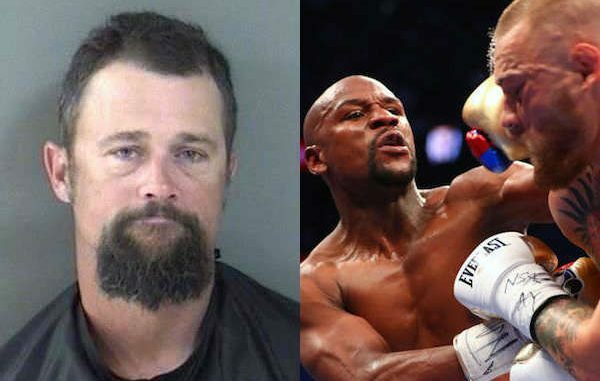 A caller told the Indian River County Sheriff’s Office that her boyfriend, identified as 36-year-old Travis Jarrett, was heavily intoxicated at her Vero Beach home where an argument progressed after watching the televised boxing match. 911 dispatch could allegedly hear Jarrett in the background yelling, and what appeared to be him hitting the caller, according to the report. Upon arrival, deputies knocked several times, but no one opened the door. With the caller still on the line, the deputy asked dispatch to tell the caller to open the door. “As the front door opened, I observed a female walk outside. At first sight, I saw what I thought was blood covering the female’s forehead. I asked her if she was ok and she stated ‘it is black berries,'” the deputy said. The woman told deputies Jarrett was in the shower. She explained that they have been arguing ever since watching the televised Mayweather vs. McGregor boxing fight. The victim stated that Jarrett was drunk and as she drove him home, she stopped at a stop sign, which he thought she was kicking him out of the car. Jarrett exited the vehicle and started to throw dirt into her car. She left him there and went home. But soon later, Jarrett returned to her home and was more angry that he had to walk back. “While at the house the defendant returned very angry. She was inside the bathroom with the door closed,” the deputy said. Jarrett kicked open the bathroom door, and open-handed slapped her with a bunch of black berries to her forehead. As deputies were speaking with the girlfriend, they could hear Jarrett finishing up his shower and then slamming doors and other items inside the Vero Beach residence. Jarrett was arrested and transported to the Indian River County Jail where he was charged with Battery Domestic Violence.